There has long been a controversy over the tax-free status of the National Football League, which racks in massive profits while claiming to be a charity. The latest figures will only deepen that controversy. In 2012, the NFL gave only $2.3 million to charity and virtually all of that went to the NFL Hall of Fame. In the meantime, it gave NFL commissioner Roger Goodell $29.5 million for what many consider the greatest – and easiest — job in the world. Through creative bookkeeping, the NFL is also claiming to be actually in the red by some $316 million. What is bizarre is that Goodell is making a tenth of what the NFL claimed to make in total assets in 2012 — $255 million. Think of what that ratio would mean in large corporations. The same year, Exxon made $16 billion . If Goodell was CEO of Exxon, he could demand 1,600,000,000 in salary. The NFL is required to filed Form 990 where it claimed the $255 million in revenue — up from $240 million in 2011. It also has “assets” worth over $822 million. While the NFL increased its giving from $900,000 to $2.3 million, it spent $36 million on new office digs and increased its own salaries from $27 million to a total of over $107 million. Not bad for a charity given protection from taxation. 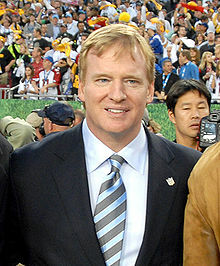 Roger Friedman noted that “going by numbers in Forbes, Goodell would come in at around number 28 of the highest paid CEOs in 2012. He made more than the heads of FedEx, AT&T, Heinz, Ford Motors, Goldman Sachs, as well as Rupert Murdoch.” A fair point to be sure. Why is a charity competing in salaries with for-profit corporations while not paying taxes? Moreover, why is the NFL Commissioner competing with CEOs of truly complex and global companies in compensation? Goodell himself is not what one would immediately recognize as a top corporate candidate on the CEO salary scale. He is a home grown executive with the NFL. He is the son of the late United States Senator Charles Ellsworth Goodell, a Republican from New York and graduated in 1981 from Washington & Jefferson College in Washington, Pennsylvania with a degree in economics. He then interned at the NFL as an administrative intern and then later joined the New York Jets as an intern. In 1987, he was appointed assistant to the president of the American Football Conference (Lamar Hunt) and was later made the NFL’s Executive Vice President and Chief Operating Officer in December 2001. He was involved in various NFL ventures and expansion plans as well as television deals by “the charity.” He certainly knows the league, but roughly $30 million in annual compensation? Then there is that whole profit thing. The NFL teams continue to rank as the most profitable sporting organizations in the world. The teams are worth, on average, $1.17 billion — 5% more than the prior year. Senator Tom Coburn (R., Ok) has shown courage in challenging the NFL charity status and called for the company to lose its tax exemption. The NFL insists that it is only the league that is a charity but that does not answer the question of why it should be given this tax shelter. Football team owners are constantly demanding huge subsidies from cities and states under the threat of taking away their local teams. At the same time, they are sheltering hundreds of millions under a highly dubious charity claim. As many of you know, I love football. However, when I sit down to watch on Sunday, it is not like church. And it is certainly no charity. Great article. We need to wonder back in the 60’s when our Pro baseball players were making around $50,000 a year, our fathers were making $15,000-$20,000 on average. Now with multi-million $ contracts and the average salary is around $35,000 a year. I am wondering when people will wake up to our overpaid gladiators and get tired of the distractions from what is really happening to the merging of the corporate states into a global governance. So I presume that no one else can see it. I found a couple of messages in moderation and released them. WordPress will often block comments with too many links or an address may be similar to a banned spam site. Sometimes it seems like just gremlins. All comments by you have been sent for publication. Your posts are not being “targeted” and no regular monitoring occurs on this site. Sometimes, however, for reasons known only to WordPress techies, a comment will get caught in the spam filter.